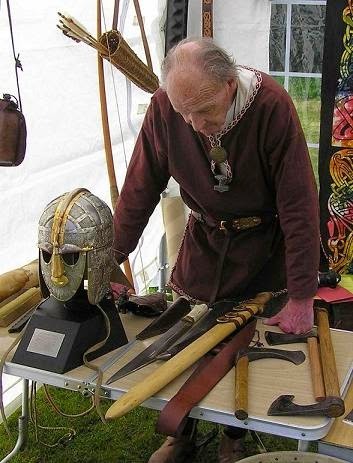 Last year (2014) not long after we had arrived at West Stow Anglo-Saxon Village we learned of the death of an old friend; Roy Bickerstaffe, a long-standing fellow member of Þa Engliscan Gesiþas - the Anglo-Saxon Society, archery enthusiast and inspirational medievalist. A number of founding members of the Thegns had had many of their first experiences of living history with Roy, who's support and great knowledge had always been an inspiration. Later that evening, as we sat around the hall-fire, wrapped in our cloaks, having eaten and drunk well, we toasted Roy’s memory, the person with whom we had shared much ale in the past. I dedicate this article to his memory. Winingas are long strips of cloth which were wrapped around the lower legs. Also known as ‘leg bindings’, they are similar to the ‘puttees’ worn by British soldiers at the time of the Great War. These items of clothing, although sometimes an annoyance for the modern living historian, have considerable utility, are almost ubiquitous on manuscript depictions of men during the Anglo-Saxon period, and are worth a brief study. This Old English word winingas is the plural of wining (a word which relates to the act of ‘winding’). The equivalent term in Old Norse is Vindingr. On the basis of depictions and reconstruction, it seems winingas were probably usually between 2 - 3 inches (5 -7.5 cm.) wide and around 12 feet (3.66m.) long. The wining was wrapped around the lower leg in a spiral, starting at the ankle (or around the foot) and ending just below the knee. It would probably have been typical to simply tuck the ends into the bandaging, although some have suggested the tying of braid over the top to secure them. Occasionally pins or clasps were used. Winingas were in common use across Northern Europe during the European Iron Age / Early Medieval Period. Galen, physician to Marcus Aurelius describes something called fascia crurales, worn by hunters. These were probably what we would recognise as winingas. It is likely that soldiers of the Late Roman period, many of whom would have been of Germanic origin, would have worn these when appropriate. Bandage-like fragments of textile found at Vindolanda and dating to the late 1st century CE, suggest that leg-wrappings may be even more ancient. Suetonius states that the Emperor Augustus frequently wore leg-wrappings against the cold but Marcus Fabius Quintilianus wrote that they were only used by invalids. Certainly, by the 3rd century CE, their use must have been common; Emperor Alexander Severus (Roman Emperor from 222 to 235 CE) is recorded as always wearing them. Winingas are commonly depicted in artwork and examples have been recovered from bogs, where anaerobic conditions have preserved the material. The small clasps which often secured the winingas are also sometimes recovered in situ from graves. It seems likely that most winingas were woven specially to the desired width rather than cut from a larger piece of cloth, which would necessitate hemming and stitching *. The cloth used today for ‘living history’ is almost universally a fairly loose-weave herringbone twill wool fabric. Finds from Hedeby (Old Norse Heiðabýr, German Haithabu) demonstrate that winings were also made from 2:2 twill and even 1:1 tabby woven cloth. The winingas recovered from Thorsberg and Damendorf (bog finds dating to the pre-Viking Age) were both made from a 2:2 twill. *The tabby-woven wining found at Hedeby seems to have been cut from a larger piece of material, not woven to the right size. Similar hemmed winingas have been found in bogs (Obenaltendorf Man). I am not aware of any evidence for other than woollen cloth being used for this purpose. Although linen could have been used it would likely have been far less practical, in terms of warmth and security. In practice, loosely woven wool - the stretchier the better, is most practical, being less likely to work loose at inopportune moments and become a trip hazard. Winingas could conceivably have been any colour that could be achieved on other garments, with plant dyeing. It is typical to see wingingas in brown, dark green and grey, although the Franks were said to favour red. Across depictions of men dating from the Anglo-Saxon period, winingas are practically ubiquitous. Indeed, there are cases where winingas are shown being warn, even when trousers are not! 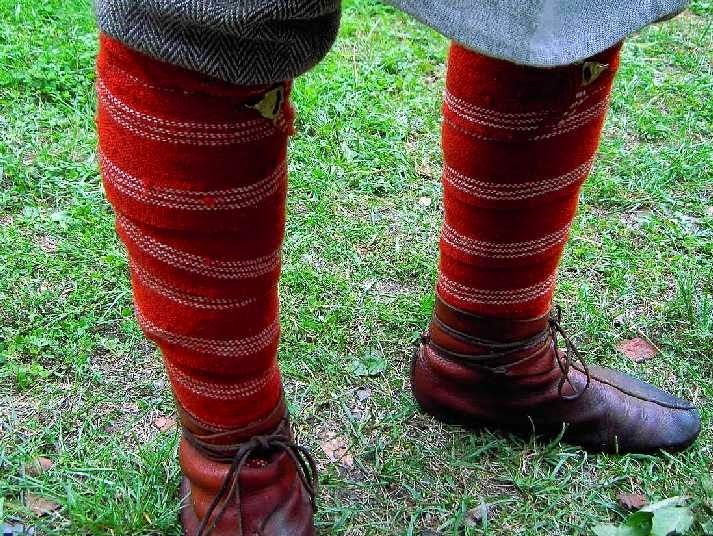 For some Anglo-Saxon and Viking-Age reenactors and living historians, winingas can be viewed as an irritation. While it is true that they add considerable time and "faff" to the costuming and de-costuming at the beginning and end of the day, and are occasionally responsible for wardrobe malfunctions which range from the annoying to the mortifying, they do have considerable utility, and their commonplace use in Anglo-Saxon times makes a lot of sense. First, winginas would have protected the bottom of the trouser legs from wear (and hence the underlying vulnerable skin of the shins), preventing tears from brambles etc. With clothing being of considerable value and costly to replace or even repair, the importance of this cannot be overstated. Winingas are warm in the winter (as well as surprisingly comfortable in the winter) and by effectively closing off the shoe, serve to keep mud, stones and snow out, keeping one's feet and legs drier, in winter conditions, than might otherwise be the case. These useful functions, in particular, lie at the root of the re-emergence of leg-bindings in Europe in the 19th century, as practical elements of military dress adopted after British Indian Army fashion ('Putees'). 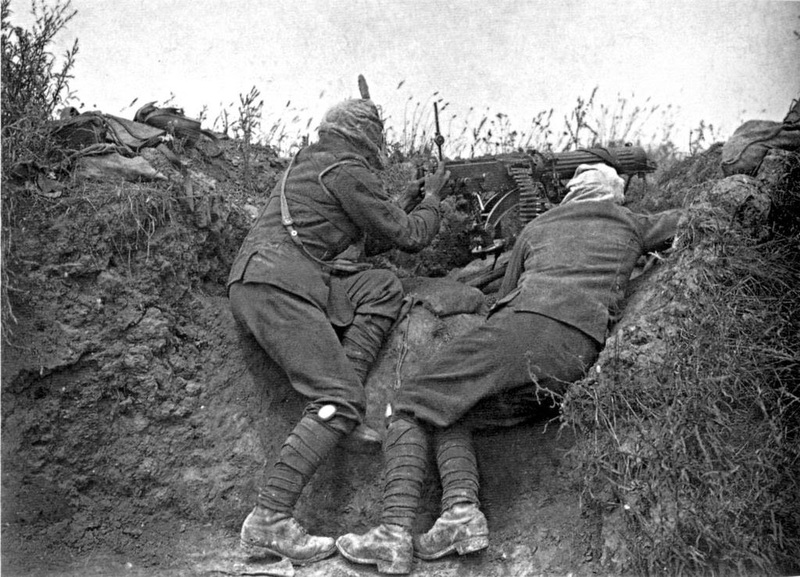 British Lewis-Gunners wearing putees; July 1916. As many long days of living history have shown, winginas, further, provide useful support for the calves during a long day on one's feet. It is further, interesting to note that they completely deny access to the skin of the leg to biting insects and ticks. The value of this aspect became acutely apparent at a recent event where participants were called to walk through long grass, and it was noticeable that no-one with winingas suffered insect bites. Spending days working the fields, or else, foraging and hunting in woodland, this aspect may have been of considerable importance to wearers in the first millennium. Winingas are simple technology and the strong woollen strips can be used in extremis as bandages, for splinting fractures and a thousand and one other purposes. Strips of cloth wound around the lower legs are a simple and very practical garment. The old re-enactor cheat of cutting winingas from a larger piece of fabric and hemming them turns out to be historically defensible. However, experience has shown that winingas made from hemmed and less stretchy material than the standard herringbone twill, adhere much less well to the leg. As one can state from considerable experience, when bandaging a limb, the correct crêpe bandage is essential. The correct technique when applying winingas is also critical. I would here like to pay tribute to the man who first instructed me on how to put on my winingas; Roy Bickerstaffe. Many years ago, at a living history event, I asked Roy for advice. “How do you put these unprintable things on without them pulling one’s trousers down?” I asked. Kindly, this veteran explained that the trick was to use the correct material and to apply the windings sitting down - never stooping, allowing plenty of slack in the trousers above the knee. I have always followed his advice since and my winingas have never let me down! A new article! Thank you. I personally wrap mine from knee to ancle. I never have a problem with them falling, only seperating at times because I have large calves. I've also found that linen doesn't work well at all. Wool on wool is the best, it's almost like a dark ages Velcro. I'm saddened to read about the passing of your friend. He sounds like a great man. Wool in the brush, when wet and cold is a severe hazard. The ability to remove the windings, dry them, and then reapply them would have been very useful..